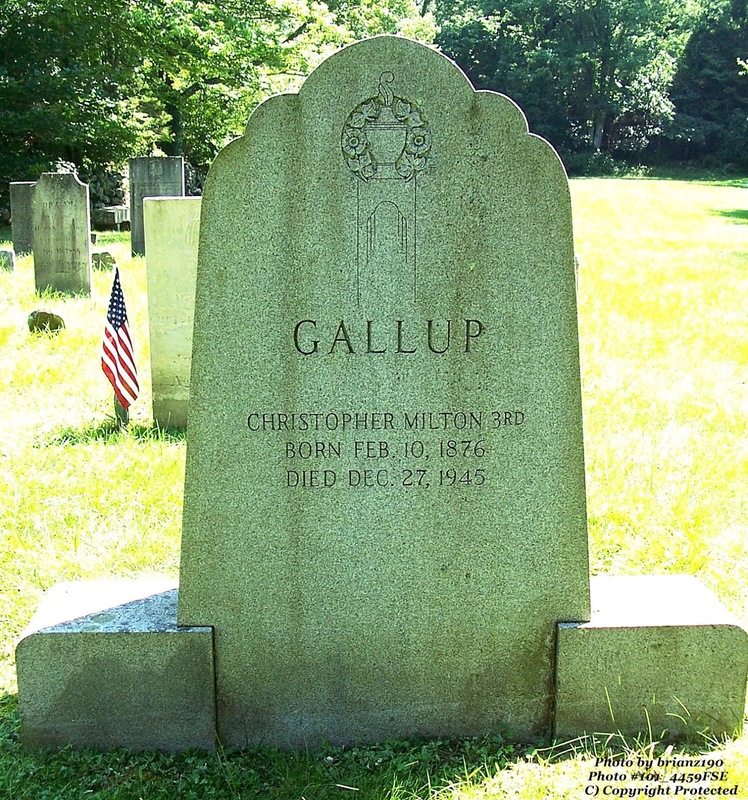 Christopher Milton Gallup, 3rd was the President of the Gallup Family Association from 1934 until his death in 1945. He had two spouses, Christine Richmond Ewing (1879-1937) and Ruth Newcomb Kinney (1866-1971). He married his second wife in 1940 and his first wife in 1899. He left no children from either marriage. The Gallup Genealogy (2009) lists him as #4542 on pages 545 and 758 and states that he as a Yale graduate and that he developed earthworm tillage. I found him listed at Ancestry.com in a Yale publication called the Yale Banner in 1896. His World War I Draft card states he lived in Hartford and was employed by Traveler's Insurance and was tall, medium build and had dark brown hair and eyes. In the 1900 census he lists his occupation as Civil Engineer (probably when the earthworm tillage method was developed) but by 1920 he was an underwriter in the insurance industry. In 1930, he went back to farming. Christopher was the only son of Christopher M. GALLUP and his wife Hannah LAMB. He had two sisters, Harriet Tooker GALLUP and Anna Billings GALLUP. Anna is buried next to her brother. She lived with Christopher and his second wife in 1940 in North Stonington. Both of Christopher's sisters were MIT graduates! Christopher died in Stonington, CT on 27 Dec 1945. During his tenure as President of the Gallup Family Association he ensured the preservation of the cemetery where he now rests. His gravestone is both a grave marker and a large memorial.